According to legend, Dangun Wanggeom was the founder of Gojoseon the first kingdom of Korea. 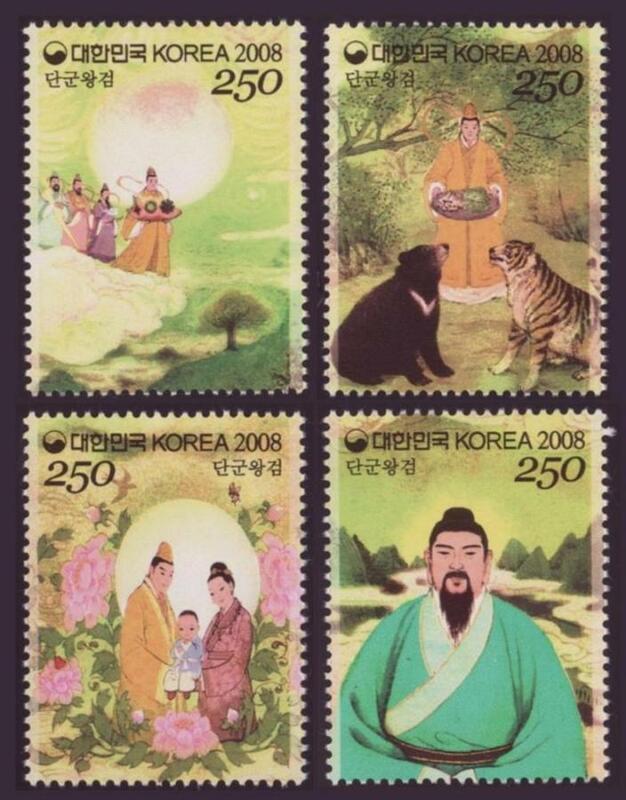 On July 8, 2008 the Korean Post (South Korea) issued a four stamp set, described as special stamps, depicting various scenes from the legend. The stamp issue also featured a souvenir sheet which contains a total of 12 stamps (3 complete sets), a panorama of the story, and Korean text. The Dangun (or Tangun) story interweaves history and mythology. References to Dangun begin to appear in about the 13th century. Scholars place him as contemporary to the Chinese Emperor Yao, and his founding of Gojoseon is usually dated at 2333 BC. Throughout the history of the Korean people, Dangun Wanggeom has figured prominently as the subject of religious worship and as part of the national identity. 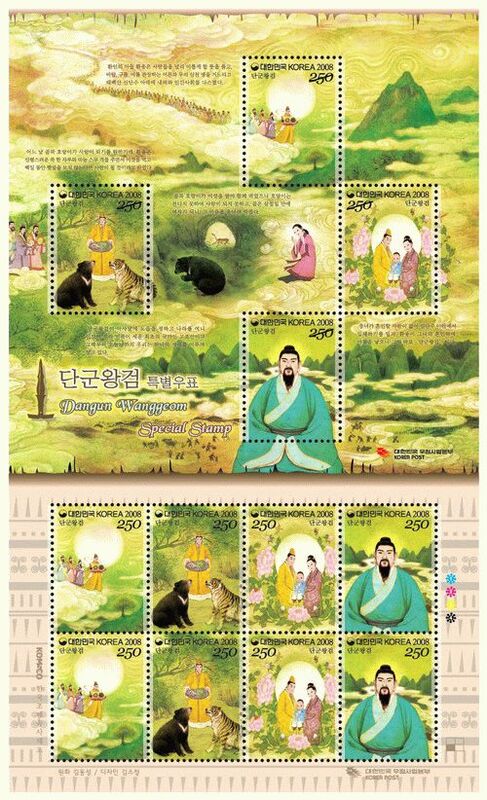 The legend, which can be followed in the illustrations of the stamps, begins when Hwanin the god of heavens elects to send his son Hwanung to earth to rule humanity. Hwanung was chosen for this role because of his affection for mankind and interest in the affairs of the earth. Hwanung landed at the summit of the Taebaek Mountain accompanied by 3,000 vassals and named the place Sinsi meaning Divine City. Also accompanying Hwanung were the ministers of wind, rain, and clouds. Together they established laws and taught people various arts, medicine, and agriculture. They also took charge of 360 tasks of mankind which are essential matters that include harvest, life, and punishment. During this time a bear and a tiger that lived together in a cave prayed to become human. Hwanung gave them one bundle of mugwort and 20 cloves of garlic and ordered them to eat only this special food and not to see sunlight for 100 days. The tiger was impatient and left the cave early. The bear, however, stayed and turned into a woman. The bear-woman was grateful, but soon become lonely and prayed to Hwanung for a son. Hwanung heard her prayers and made her his wife, and soon she gave birth to a son, who was named Dangun Wanggeom. Dangun ascended to the throne, built the walled city of Unknown, and called the kingdom Joseon (or Chosun) meaning Morning Calm. Today the place is called Gojoseon meaning Old/Ancient Joseon so as not to be confused with later kingdoms. Dangun ruled for 1,500 years when at the age of 1,908 he took a spiritual form and became a mountain god.